In this eye-opening book, the first to investigate the explosion of the multibillion-dollar preschool entertainment business and its effects on families, Dade Hayes -- an entertainment expert, author, and concerned father -- lifts the veil on the closely guarded process of marketing to the ultra-young and their parents. Like many parents, Dade Hayes grabbed "me time" by plopping his daughter in front of the TV, relaxing while Margot delighted in the sights and sounds of Barney and the Teletubbies. But when Margot got hooked, screaming whenever the TV was turned off, Hayes set out to explore the vast universe of this industry in which preschoolers devour $21 billion worth of entertainment. Going behind the scenes to talk with executives, writers, and marketers who see the value of educational TV, Hayes finds compelling research that watching TV may raise IQs and increase vocabularies. On the other side, he brings in the voices of pediatricians and child psychologists who warn against "babysitter TV" and ask whether "TV trance" is healthy -- in spite of the relaxation that the lull affords exhausted parents -- as recent studies link early television viewing with obesity, attention and cognitive problems, and violence. Along the way, Hayes narrates the fascinating evolution of Nickelodeon's bilingual preschool gamble, Ni Hao, Kai-lan, from an art student's Internet doodles to its final product: an educationally fortified, Dora-inflected, test audience-approved television show. At the show's debut, jittery experts hold their breath as the tweaked and researched Kai-lan faces Mr. Potato Head in the battle for a three-year-old's attention. Anytime Playdate reveals the marketing science of capturing a toddler's attention, examining whether Baby Einstein and its ilk will make babies smarter, or if, conversely, television makes babies passive and uncritical, their imaginations colonized by marketing schemes before they even speak. It tells us why the raucous Dora the Explorer has usurped Blues Clues for preschool primacy, why the Brit hit In the Night Garden won't follow Teletubbies into American tot stardom, and why the comparatively quiet and wholesome Sesame Street has reigned for decades. Hayes vividly portrays the educators, psychologists, executives, parents, and, lest we forget, kids who have shaped the history of children's television, uncovering the tensions between the many personalities, the creative foment that combines story, music, and message in this medium to produce today's almost dizzying array of products and choices. In the end, Hayes gives readers a provocative but balanced portrait of an age in technological transition, and shows that what's at stake in the "Rattle Battle" is nothing less than the character of the next generation. After introducing his infant daughter to TV, Variety editor and author Hayes (Open Wide: How Hollywood Box Office Became a National Obsession) begins to wonder how the $21-billion preschool marketTV shows, DVDs, CDs and tie-in toysworks behind the scenes. He sets out to question the experts, including honchos at Nickelodeon and CTW, as well as entrepreneurs such as Julie Clark, whose brainchild was Baby Einstein. Hayes gives a nod to the American Academy of Pediatrics recommendation of no screen time for children under two, but also notes that only 6% of parents are aware of it. He learns, too, that there has been no government research to study preschool media use. Raised on Mr. Rogers and Sesame Street in a pro-TV family (his father worked in the biz), Hayes doggedly follows the paths of such heavy hitters as Dora the Explorer and Blues Clues, dissecting their appeal and pondering the merits of TV for the very young even while continuing to let his daughter tune in. While one pundit notes, The content on television... can open windows and widen horizons for children who otherwise dont have those experiences, the effect is eerily chilling when Hayess newborn son tilts his head toward the screen. (May) Copyright 2008 Reed Business Information. 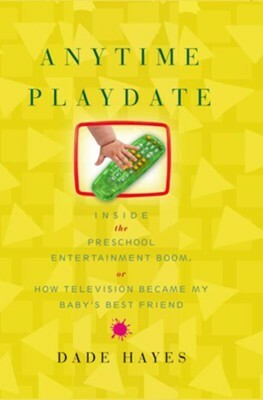 I'm the author/artist and I want to review Anytime Playdate: Inside the Preschool Entertainment Boom, or, How Television Became My Baby's Best Friend - eBook.